View of the City of Montreal in Canada from the top of the mountain. In 1535 Jacques Cartier and his men visited the small Iroquois village of Hochelaga and climbed the mountain, naming it Mount Royal. It was not until 1642 that it was further developed by Paul de Chomedey as a French missionary colony known as ‘Villa Marie’. 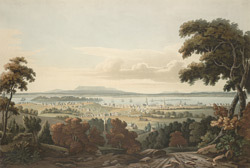 The city prospered as a trade centre for the growing fur industry and remained in French possession until the 1760s when Montreal was surrendered to the British army.